I was completely satisfied with the with fence that you installed around the perimeter of my property in Red Bank, N.J. I have had numerous comments about the beauty of the fence by various people who pass by. Your staff were extremely competent & always cleaned up when finished. 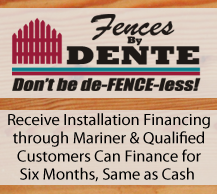 Your price was competitive & I would recommend Dente Fence to those needed a fence. Your office staff, Malisa was very courteous & helpful & was able to answer all of my questions & communicate all my requests to you. It was a pleasure dealing with you & your company. Our experience working with the company, specifically with Gene, was very positive and I can recommend them without hesitation. And our expectations were met and likely exceeded. We did obtain other estimates from what I expect are some of Dente's main competitors and pricing was very competitive. Yes I would go to Fences By Dente in the future and I would recommend without hesitation. We did feel a sense of reliability in the overall experience and we would certainly recommend your services to others. We would use the services again if necessary and overall we feel satisfied with the fence. Your services met with our expectations and the installers were both courteous and mindful. First of all, I love the fence. It looks great!! Your staff is amazing; so nice to work with. They are kind and caring men whom you should feel so good to have as your staff. Hi, I am the executive director of The Rugby School. My father started the school in 1977. When he passed away in 2006 I took over. We have dealt with many companies over the years. Your company is one of the best ones we worked with. My custodian, Larry was very pleased with the ease of the process from estimate to installation to completion. If we need more fencing you will be the only company we call. Thanks so much! KEEP UP THE GREAT WORK! Thank you for repairing my fence after the storm at no cost. It is truly appreciated. I’ve seen your ads in the Coaster Paper which is great. I tell anyone who is thinking about getting a fence to call you. The fence is working perfectly for our needs and we’ve gotten so many compliments. Thanks very much. I chose Fences By Dente because they had done such a great job for me about 10 years ago on a one-acre property in Tinton Falls. Gene was friendly and honest back then and nothing has changed. He came out to assess the work I needed for my new location which had a mix of rotted old wooden fence, metal rail, and cheap box store vinyl. I wanted the old stuff out and replaced with quality PVC fencing plus to fence in a big part of the back yard that was previously open. The price quoted was also the final price, even though they ended up having to do a little extra work dealing with post holes in a few areas where sub-surface concrete was discovered. The crew that came out to do the work were friendly, thorough, and asked questions if they weren't sure how I wanted something. The total price was competitive and more than fair as I had also searched on the internet for cost of materials used. Overall it was a great job and I'd definitely recommend Fences by Dente to friends or family. The entire transaction with Fences By Dente, from initial estimate to job completion, was seamless. Dente’s workers knew exactly what to do and where to erect the 250’+ fencing BEFORE they arrived at my home. The professionals from Fences By Dente performed superbly. The project spanned a few days and they cleaned-up after the end of each day. Upon project completion, they left my property in better condition and aesthetically-superior than when they arrived.